Kashyapa Scheme for Food & Shelter (KS-FS) . 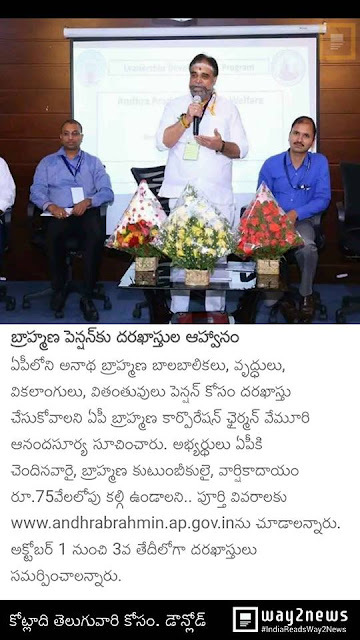 Andhra Pradesh Brahmin Welfare Corporation (ABC) Limited, a Government of Andhra Pradesh undertaking, is introducing “Kashyapa Scheme for Food & Shelter” (KS-FS) for the poor Brahmins in Andhra Pradesh. Under this scheme, an amount of Rs. 1,000/- per month shall be paid to the Orphan children, Differently abled, Widows and Elderly (Rs. 3,000/- per month if any elderly staying in Old-Age home), selected through the prescribed process. (Separated from husbands) and Elderly Brahmins of Andhra Pradesh covering all 13 districts. • The applicant should belong to Brahmin community and reside in Andhra Pradesh. husband, but do not have legal documents) of any age. • Eligible applicants shall submit applications online (www.andhrabrahmin.ap.gov.in). • Applicants may take support of internet centre or selfless volunteers. o Aadhar Card of the applicant. Pradesh and getting pension through NTR Bharosa Scheme. process and their decision will be final.